Until You by Jeannie Moon is now available on all platforms! 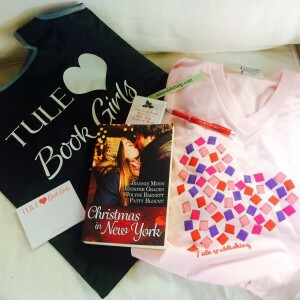 To enter to win a four book anthology of Tule’s Christmas in New York series, featuring Jeannie‘s This Christmas, and tons of reader swag, tell us if you’ve ever dated a younger guy. What was your experience? Do you think it will work out for Kate and David? A random winner will be announced Tuesday, March 24th! Want to start reading? After you enter the giveaway, click here for page 1, chapter 1! Happy reading! I haven’t dated a younger guy, but I think depending on the age of the couple I think it could work. I’ve never dated a younger guy, but I could be tempted! I’ll bet it would work out fine! Yes! I’m 3/4 years older than my husband depending on the time of year. We got together when he was 18 I was 21. We met at our first job. We’ve been together for 15 years married for 10. Yes I did, but what a mistake that was! I haven’t dated a younger guy and I probably never will considering I have a partner already. But I do know couples that have this kind of relationship and it works superb for them. I’ve never dated a younger guy, but age doesn’t have to be an issue if you have other things in common. i am currently dating a younger guy. we were friends way before we began to see each other romantically, so i think that helps. i think David will win her heart! I did a couple times, didn’t work out very well. Maybe we were all just too young…It has usually only been a couple of years in age difference. I really didn’t…but I think I’d consider it based on the person. Yes I’ve dated a younger guy. The age difference didn’t really matter. It didn’t work out…we were just at different places in our lives. It was an experience though and I enjoyed it while it lasted. Found my husband before I had the chance. It’s a 50/50 score i would say. Age doesn’t play such a big role, it’s mere on how mature the person are. My parents are 10 years apart and they are still married – 41 years coming September. I have an the plan is never to again. I hope for the best for the book. I am sure they can work it out. I think depending on both people’s maturity it can go very well or horribly bad. I forgot to say: whether it works out depends on the two people involved, their maturity level and how much they work on the relationship. I dated a man who was three years younger than me, but anyone with a significant age difference. Not sure I would want to. That was supposed to say – but not anyone with a significant age difference. Huge joke in my family, all three of us married guys younger. Only 1 or 2 years, but I dated mine in high school my junior and senior year. It’s only ‘an issue’ when we go up into the next decade, lol! Yeah but it did not work out since I was not ready to settle down. I haven’t dated a younger guy. I have dated two guys who were younger than me (only by a few years). I didn’t have good experiences with them at all. But it could have just been those guys. I prefer older men (although my husband is a year younger then I am). Went with a guy 7 years younger than me for awhile. I Think the older we get that age doesn’t really make that much of difference. No I have not dated a younger man. I think it will work out with David and Kate. I hope they have a baby. Nope, I haven’t dated a younger guy. I know a couple where she is about 3 years older than her husband and they are still together 25+ years later. At ages 30 and 40 both David and Kate are hopefully mature enough to know what they want and if the love is true, work to keeping it. I dated a younger guy once only a year younger but that year made a HUGE difference in the maturity level!